What happens BEFORE the guest has booked. The map systematically lays out how you will attract the right guests and move them toward booking, and then through delivering remarkable guest experiences while unlocking incremental revenue-generation opportunities, and then how you will make guests part of your family for a lifetime. 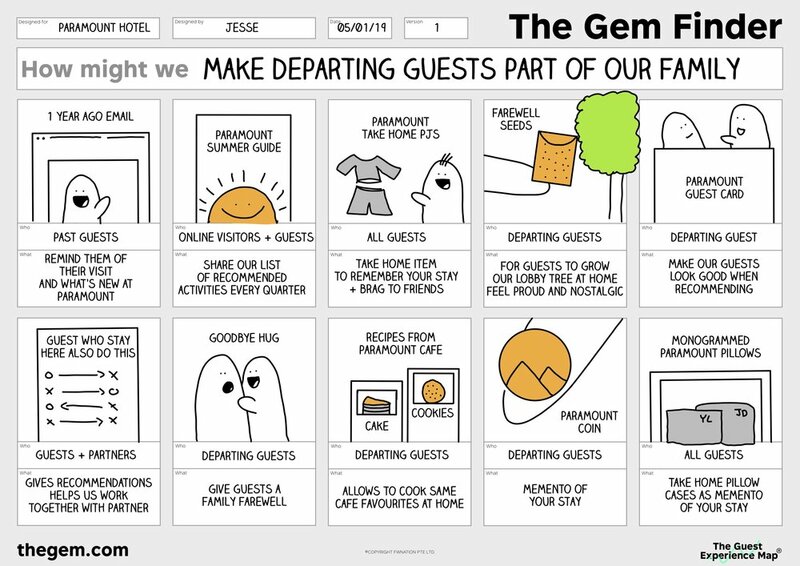 The Guest Experience Map® helps you create remarkable experiences around 10 key moments. Here’s how a map can help you. This could be our overall guest experience in general, or a map for specific guest segments, or experiences within your business. Launching a new experience? The Guest Experience Map® helps you create a plan for how you will deliver this experience. By mapping out your current experience, you can identify opportunities for strategic breakthroughs by applying the 10 Profit Activator to each major component of our map. A great guest experience is really about creating a collection of better moments. The GEM cards are a simple and powerful tool to explore a range of possibilities in designing memorable and meaningful moments for our guests. What moments should you focus on? How to design remarkable moments. How to use the GEM cards. 12 remarkable GEMs in the wild. What makes a great GEM? Included are blank tools you can print and use with your teams.